The Coastal Commission is recruiting citizen scientists to take part in its California King Tides Project by taking photographs of the seashore. The highest tides of the year, or king tides, are due on January 20-21, 2019. Caused by the alignment of sun, moon, and Earth, the exceptional tides could give a picture of California’s shoreline under the effects of sea-level rise, estimated by the City of Santa Barbara to be more than six feet by 2100 if progress continues to stall on changing human greenhouse gas production. Should king tides occur when a storm hits, the large waves they produce can send sea water surging landward even farther. 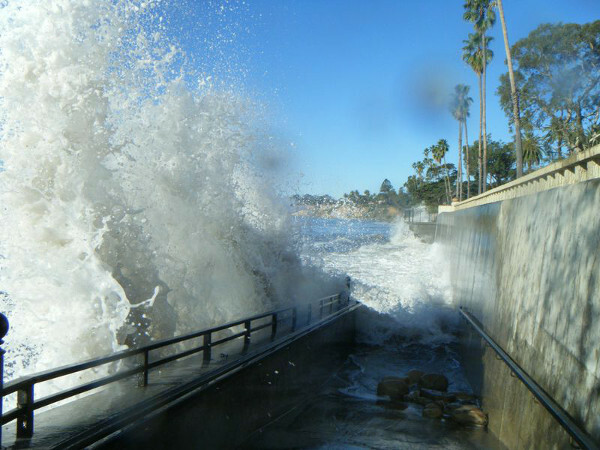 Santa Barbara Channelkeeper, a participant in the photo survey, suggests that the wave effect on sensitive habitat needs to be documented, as well as the effects on buildings, sea walls, piers, and other infrastructure. The full information on beaches across California and how to submit photographs are at the website coastal.ca.gov/kingtides. Santa Barbara County beaches suggested for inclusion are Coal Oil Point, Sands, Leadbetter, Hendry’s, Butterfly, Miramar, Carpinteria Salt Marsh, Goleta Beach, Carpinteria State Beach, and Rincon. Interestingly, this push for citizen participation comes at a time when the federal government is in a budgetary shutdown, leading to messages like this at NOAA, “The website you are trying to access is not available at this time due to a lapse in appropriation,” for its page about king tides.